For new drivers, or experienced drivers, a GPS in-car navigation system can be a very valuable tool. Clearly, the most important driving priority is to keep aware of the road environment. At the same time, a good GPS in-car navigation system does not have to be a distraction when it’s used properly. Following some basic rules, it will make for safer driving and a more relaxed ride. With a reliable GPS in-car navigation system, drivers know exactly where they’re located, and precisely where they’re going. It’s quite rare to get lost with a GPS, after a mistake has been made. GPS can recalculate a route, get things back on track, and carry on with little stress or distraction. There is no more need for maps, and no more need for passengers to provide directions. This GPS system features Apple CarPlay™. It’s a safe way to be using an iPhone® inside the car. The Apple CarPlay technology gives users a very intuitive way to make phone calls, to use Maps, to listen to uploaded music, even to access messages. The AVIC-5200NEX can also be synced with other platforms like Android™ or MirrorLink™. With everything visible on the dashboard display, communication is made easy with advanced Bluetooth connectivity. The AVIC-6200NEX system is compatible with iOS, Android™, and MirrorLink™ smartphones. 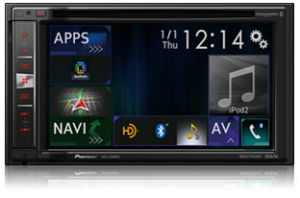 The Pioneer AppRadio® plays numerous file formats, and allows many apps to be displayed right on the dashboard. Users of iPhone® (more recent models) can take full advantage of Siri Eyes Free technology. Simply touching the NEX screen allows Siri to listen to questions and requests over a microphone and provide answers through the vehicle’s speakers. AVIC-7200NEX features Apple CarPlay™, which allows iPhone® users to make in-car phone calls, access the Maps application, and enjoy music. It’s also easy to access messages by voice or touch. This system is also compatible with Android™ and MirrorLink™ smartphones. AppRadio® Mode from Pioneer allows apps to display on the dashboard. Many iPhone® users can rely on Siri Eyes Free Technology, allowing for eyes on the road/hands on the wheel. • Features Android Auto™, allowing for complete Android functionality in the car. This feature is designed to fully minimize driver distraction – in short, eyes on the road and hands on the wheel. • Features Apple CarPlay™, which gives iPhone® users an intuitive approach to making in-car phone calls, using Maps, listening to music, and even accessing message by voice or touch. • AppRadio® simplifies all of the information required while driving. It’s a simple interface, with quick and easy access to all of the personal information required while driving in the vehicle. • Features iDatalink Maestro RR (sold separately) for touchscreen control over key functions like steering wheel controls; voice commands; satellite radio, and secondary display support.